Use on Dometic® old and new style gas valves: View Product to see specific models. 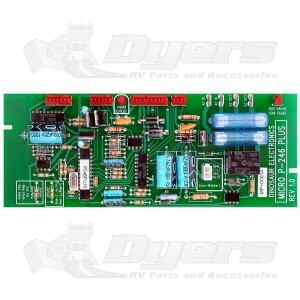 Features a circuit breaker on the board to protect 12V circuits from short circuit damage and a short circuit indicator that indicates shorts in wires to the main switch or interior light. Heavy-duty diode trips circuit breaker if the 12V DC is hooked up backwards. Fuses on the 120V AC circuits give you protection from short circuits in the heater wires and element. P-26 and all of the Dometic® model boards that they will replace. The board comes configured to work in 3-way refrigerators and a jumper can be cut to make it work in 2-way refrigerators. AC / DC / Gas operation. Fuse and circuit breaker protected.